Your first week of school sets the tone for the year! These are some of the activities we did in our first week of 2nd grade! There’s nothing wrong with posting about your first week back halfway through your third week, right? I mean every afternoon I get home I basically look like this…. I love walking around and seeing how students feel! It is also a perfect insight as to where students are in their writing development.Then, I gave each student a sticky note. They used the sticky note to graph their feelings on our “First Day Feelings” interactive anchor chart. Although I forgot to snap a picture of our FULL chart ( I was hustlin’ folks!) , it turned out that most of my students were EXCITED about their first day back! 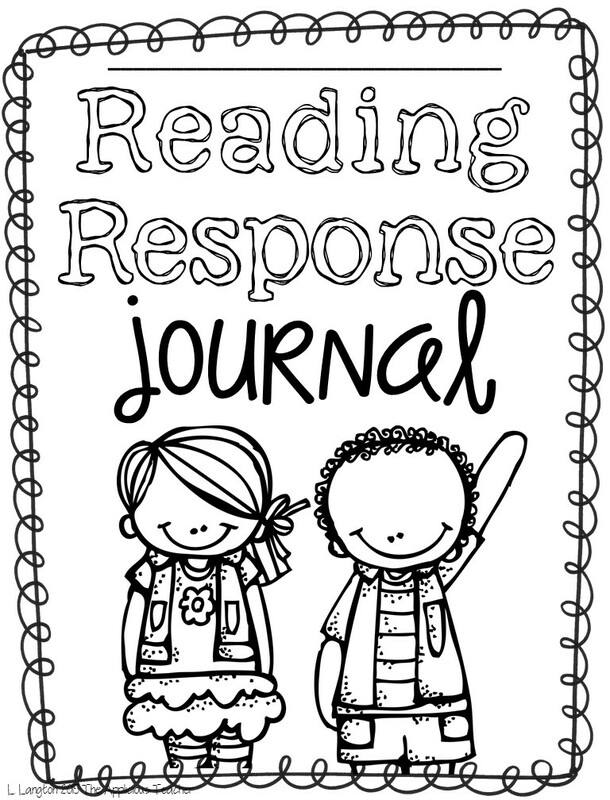 This chart is part of my First Week of School Chart Pack FREEBIE.Once students finished their entries and shared it with a buddy, I passed out a cover for our notebooks and gave them a few minutes to color it. You can grab our RRJ cover here! Then next day, we read the story as a class. This time, we were ready to work on a graphic organizer for our read aloud. After reading a story, we worked together to identify the characters and the setting of the story. We documented this information on our “Story Map” interactive anchor chart. Then, it was time to ID the problem and solution presented. 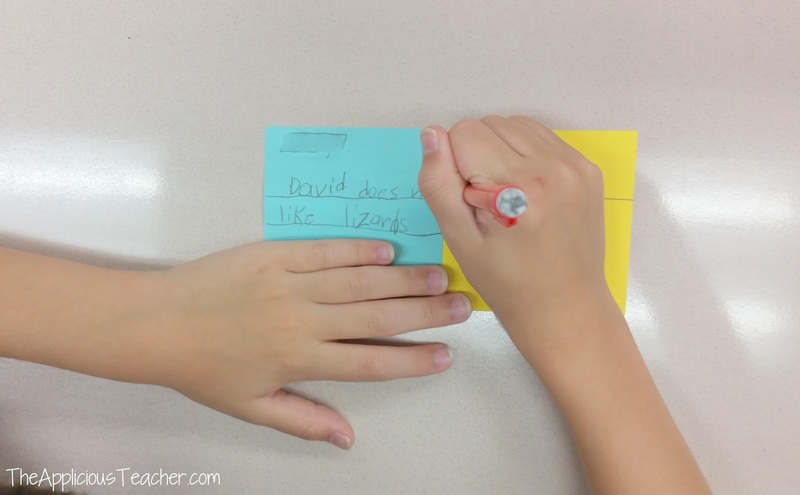 I passed out blue and yellow stickies and the students went back to the text to find the problem our character (David) had in the beginning of the story. Problems on blue and solutions on yellow. 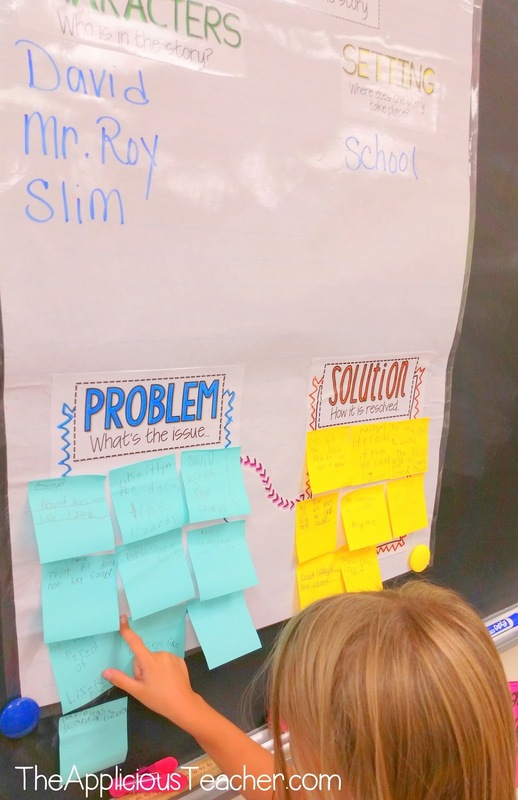 As they found their problem and solutions, they placed the sticky notes on our chart. Once everyone placed their stickies, we reviewed each other’s answers and confirmed that they were actually a problem and solution presented in the story and that our answers made sense. If our answers weren’t *quite* right, I sent students back to fix it up. I am a HUGE fan of interactive anchor charts (if you can’t tell!) 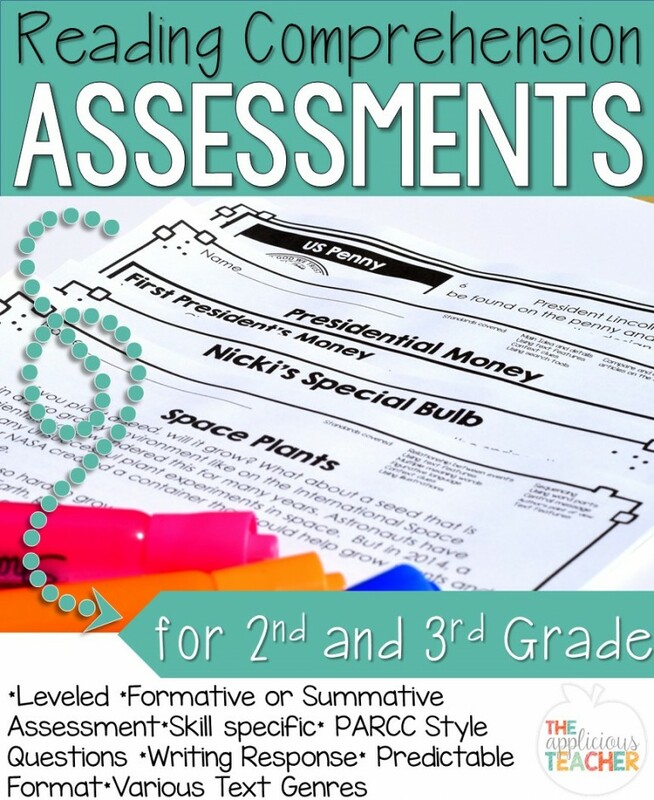 I love that they make sure every student is accountable for their learning and that students are part of the process in creating reference material for our classroom. 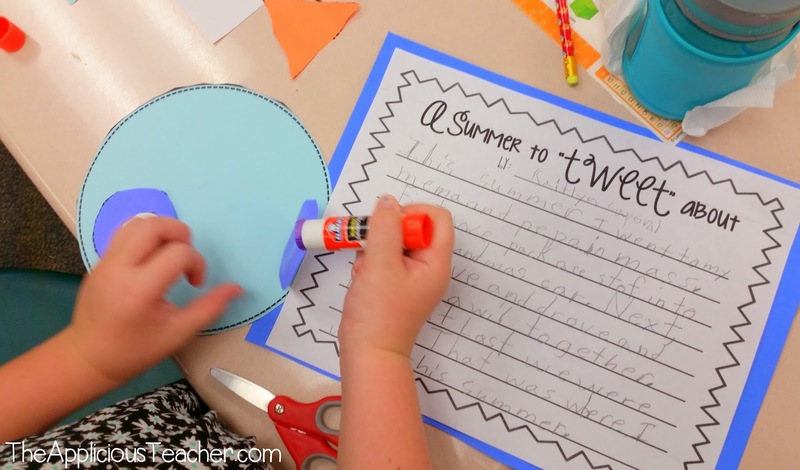 In writing, we had to share about our summer vacation fun! 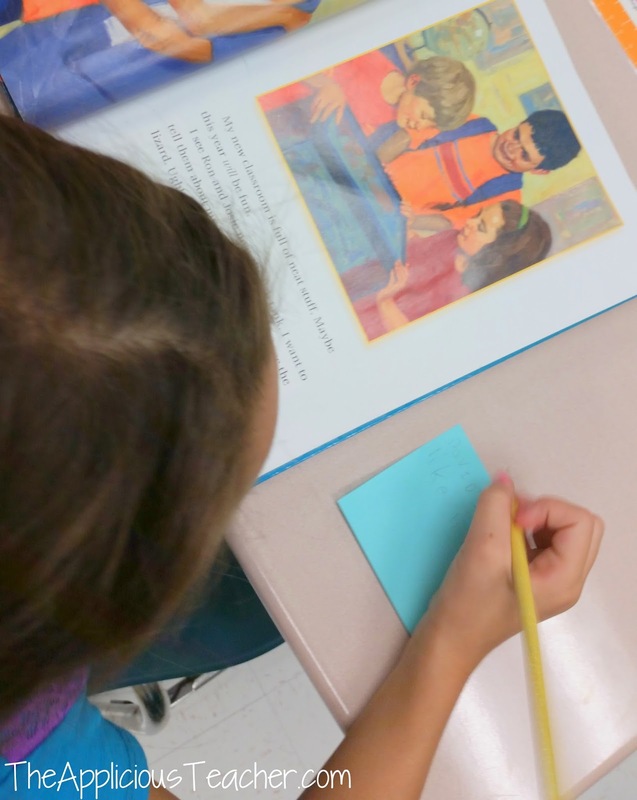 We read the story, “How I Spent my Summer Vacation” as a launching point for our stories. Such a fun tale! 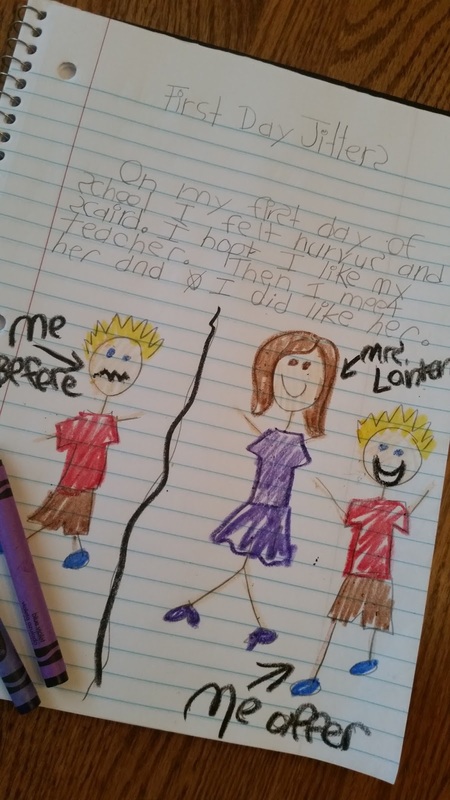 The kids LOVE deciding if the story he actual wrote for his teacher is true or not! If you don’t have access to this book, there’s this cute read aloud on YouTube. Then we discussed what we had a chance to do over the summer. 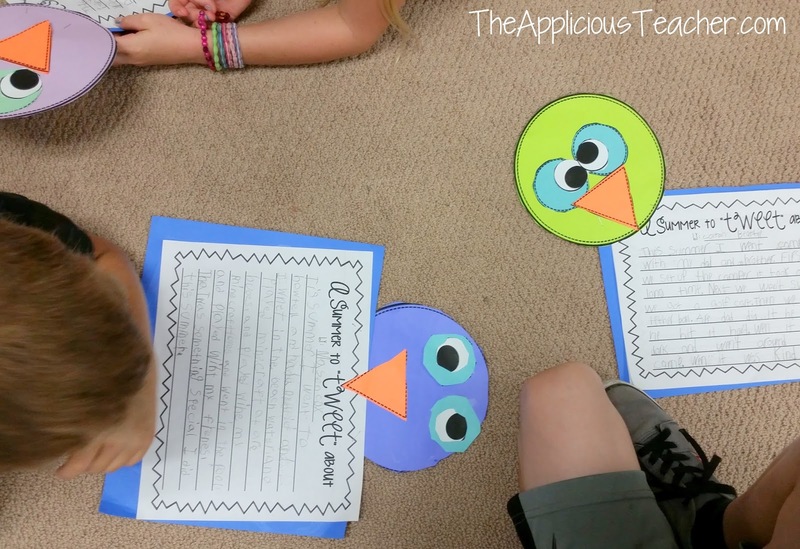 We used this cute little bird craft from Amy Lemons to publish our stories. Later in the week, the students shared their adventures in triangle groups and practiced using the “2 Stars and a Wish” routine for their stories. 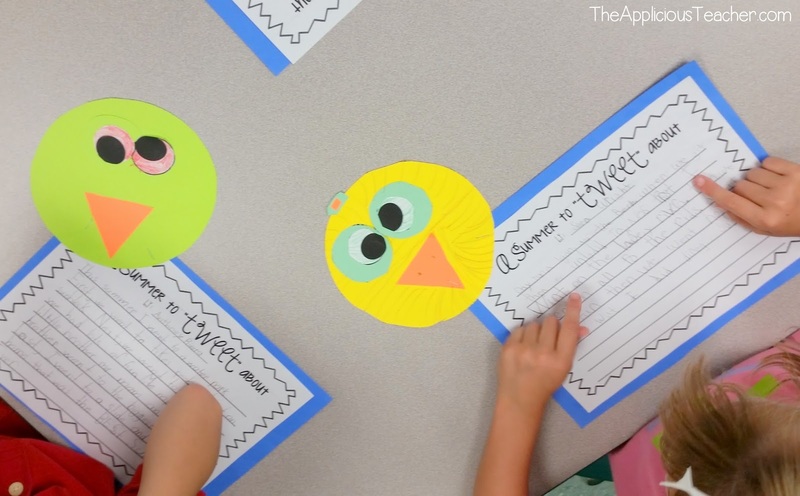 If you’re not familiar with this routine, after a student shares, the other students offer 2 items they liked or found interesting about what the student had written about (2 stars) and then ask a question about what was written. 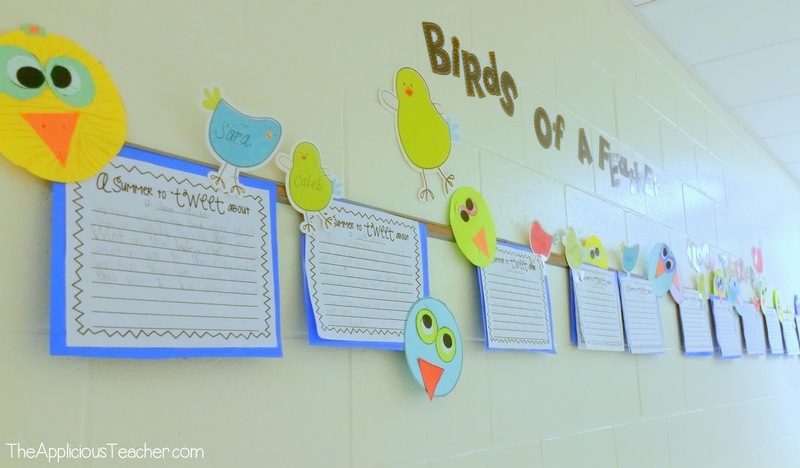 These brightly colored birds made a perfect display for our outside wall! Seriously guys… this thing has saved me from confusion and frustration through the years! 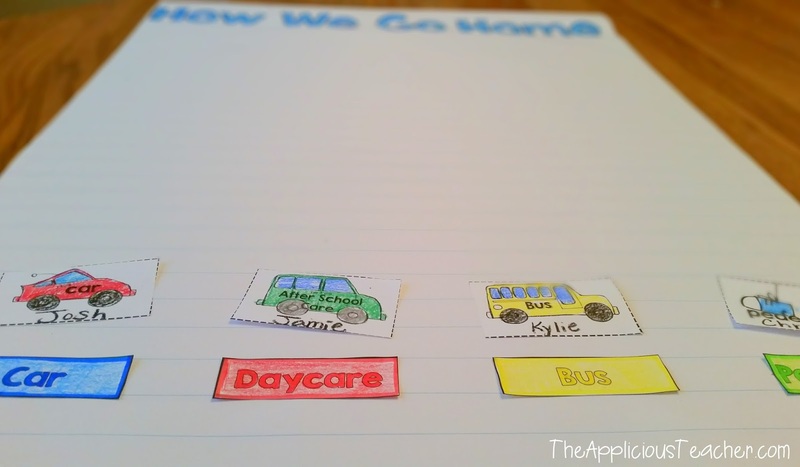 To begin our discussion on how we get home at the end of the day, I love to read the book, “This is the Way We Go to School”. Here’s another video reading of that book! It’s the perfect discussion starter for how we’re getting home that day. After reading the story, I have students think about how they got to school and how they are getting home. 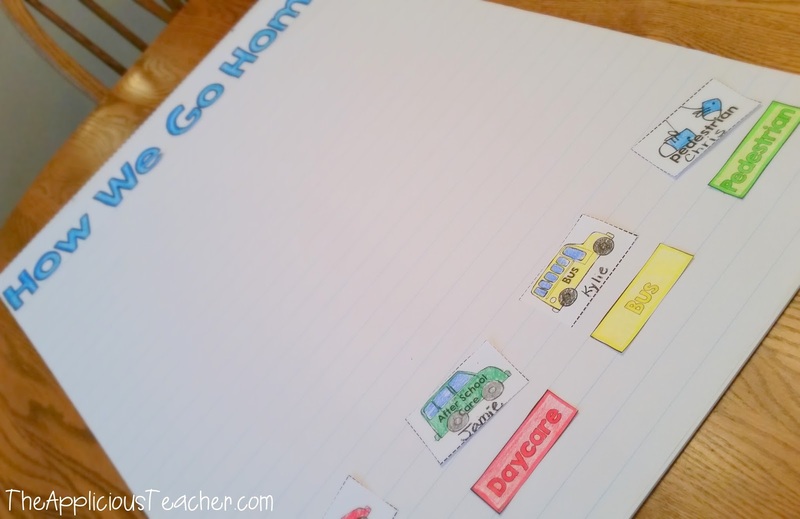 Then, each student gets a transportation cut out to represent their mode of transportation. If there is any discrepancies, or if a student is unsure, I am able to contact the parent or guardian BEFORE the end of school. This saves so much of my sanity at the end of the day! #LIFESAVER! This is the week we also started our Math Interactive Student Notebooks. This “Numbers About Me” activity was the perfect first entry in our notebooks. You can grab this activity here in my “Back to School Math Activities” Pack. Towards the end of the week, I wanted my students to get in some more practice with working in partners. We do so many activities in our room with a buddy, I really want to build those cooperation skills early on in the year. In math, we’ve been learning about basic fact strategies. One of the games we played was SUPER easy and simple! To play, each set of students received a pair of red and green number cubes. 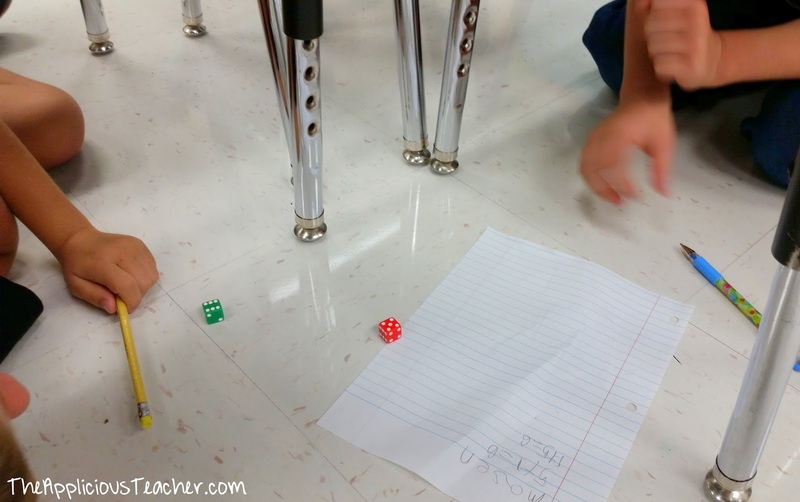 Students took turns rolling the dice. Then they used the two digits to create a number sentence and solve the basic facts problem. Originally, I have students just play orally with no recording, but through our math instruction that week, I noticed we needed some extra practice with writing number sentences. A lined sheet of paper was perfect. WHEW! That was just a little peek at our first week back. Now it’s time for this tired teacher to go to B.E.D! Thanks so much (from an incoming first-year teacher)! Great ideas, and I already ordered two of those books thanks to your suggestions.